Home / robot / Does ASEAN really need robotics in the manufacturing workforce? Does ASEAN really need robotics in the manufacturing workforce? More companies are opting for robotic automation of their manufacturing processes to get ahead, as reported by McKinsey & Company in 2017. Mainly, two types of robots, collaborative robots and industrial robots, are permeating the manufacturing sector. Manufacturing has been a pivotal factor in ASEAN’s development story by attracting earnings in foreign currency and investments for infrastructure-building, and creating employment opportunities within the region. However, the growing use of robotics in manufacturing raises the concern of human workforce displacement. What are Cobots and industrial robots? Collaborative robots or Cobots refers to robots that are designed and built with the intention of physically interacting with humans within the work environment. 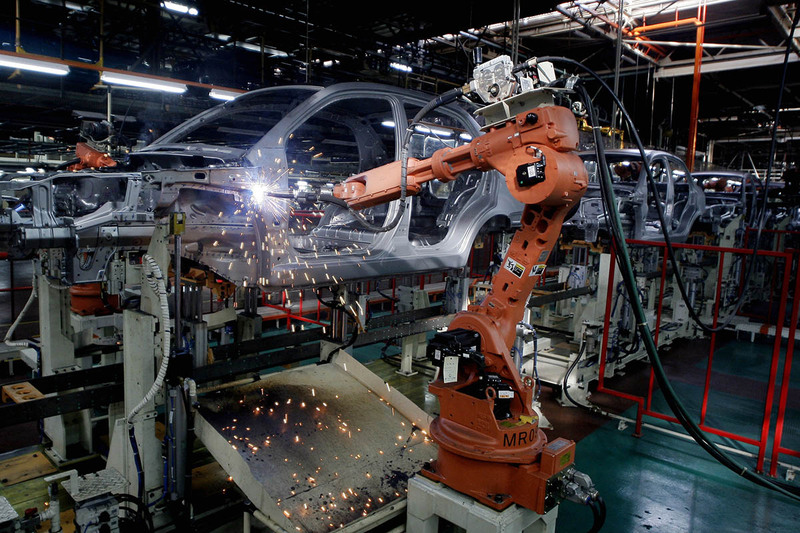 In many cases, the automotive manufacturing sector has successfully integrated the use of Cobots to carry out monotonous and hazardous tasks. Meanwhile, this frees up the human workforce to work on higher-value manual tasks. As for industrial robots, they can be programmed to automate a broad range of processes. Following the upsurge of demand for robots in the Philippines, leading collaborative robotics company, Universal Robots, has formed a partnership with Asia Integrated Machine, Inc. (AIM), the main provider of machinery in the country. This partnership is aimed towards increasing the use of robotics across the electronics, automotive and F&B industries in the Philippines. The introduction of these robots into the market has occurred amidst concerns of the displacement of the human workforce especially within the business process outsourcing (BPO) industry. The Philippines’ BPO industry has long been a provider of economic sustenance for the ASEAN nation, employing around 1.15 million people. Within the ASEAN region, Singapore takes the lead with the deployment of 488 industrial robots followed by Thailand (45), Malaysia (34) and Indonesia (5) in ratio to every 10,000 employees based on 2017 figures by the International Federation of Robotics (IFR). Singapore recently introduced the creative use of robotic swans in maintaining water quality by transmitting relevant real-time data to the Public Utilities Board (PUB). Being a high-income nation, the Singapore services sector has a large appetite for robotics to potentially reduce the hire of foreign workers within this area. In Malaysia, Comau Robotics & Automation Products has partnered up with DNC Automation, a local distributor. This partnership will spur further expansion of its distribution network in Southeast Asia to boost product sales. In 2017, Universal Robots doubled its distribution network in Malaysia with their Cobots being employed largely across manufacturing industries. The Nikkei Asian Review in 2018 reported that Thailand is keen on attracting investment, especially for the Eastern Economic Corridor, an economic zone aligned towards advanced technology including automation. In order to achieve high-income status by 2036, the development of robotics is one area in which the Thai government is gearing itself towards. In 2017, the International Labour Organisation (ILO) produced a report estimating that 56% of all salaried employment in Cambodia, Indonesia, the Philippines, Thailand and Vietnam is at risk of displacement due to technological advancements in the upcoming decades. The report states that the toughest impact will be on “labour-intensive sectors” such as textiles, clothing and footwear, resulting in job losses in the low-skilled end of the labour market. However, governments of ASEAN countries are not shying away from the introduction of robotics within their labour markets. Contrastingly, countries in the region are in active pursuit for ways to maximise efficiency with robotics. Despite the serious risk of increased unemployment within regional markets amongst lower income earners, it is apparent that ASEAN countries are reluctant to fall short of the technological progressions of more advanced nations. 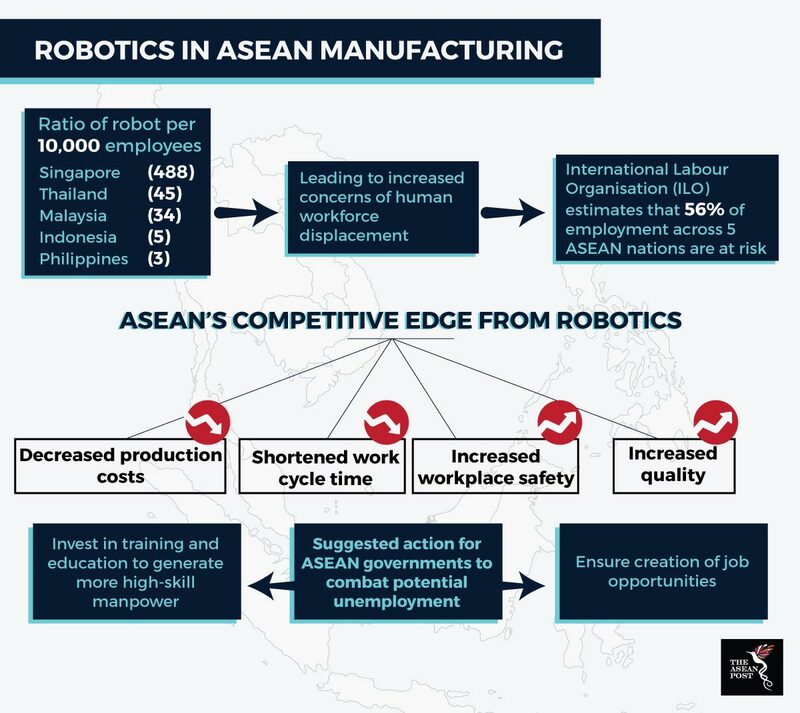 The vast implementation of robotics in manufacturing within the region can boost ASEAN’s competitive edge with decreased production costs, shorter work cycles, reduction of hazardous workplace situations and improved quality. In lieu of the robotics shift in the labour market, job losses within the ASEAN ecosystem cannot be ignored. It is essential that governments look into alternatives to combat job losses within their countries. The ILO has proposed that countries invest in education to steer towards more high-skilled manpower. Nonetheless, whether this approach will solve potential unemployment remains an issue. Training and education of the workforce may only result in a more saturated market of skilled workers. One fundamental step would be for governments to explore opportunities for creating jobs within their own respective markets which may prove to be a monumental task.